What's the difference between satellite and radar? It may seem simple if you already know the difference but you'd be surprised how many people don't know the difference between Satellite and Radar. Most times people see a composite blend of satellite and radar images so they don't know what each does. In simple terms, radar is usually what shows you precipitation and satellite shows clouds or water vapor. Find a more in depth discussion of each below. Satellite: Satellite imagery is basically pictures the cloud cover in our atmosphere. One type of satellite imagery is Visible Satellite, this is basically what it sounds like. A picture of what is visible to the satellite, this only works during daylight. The other common type of satellite imagery used is Infrared. Infrared can be used at any time because it produces imagery by sensing the temperature of the infrared emissions of clouds. Infrared Satellite is lower resolution than visible satellite and can make low clouds hard to distinguish but is great for picking out the highest clouds tops which often represents a strong storm. 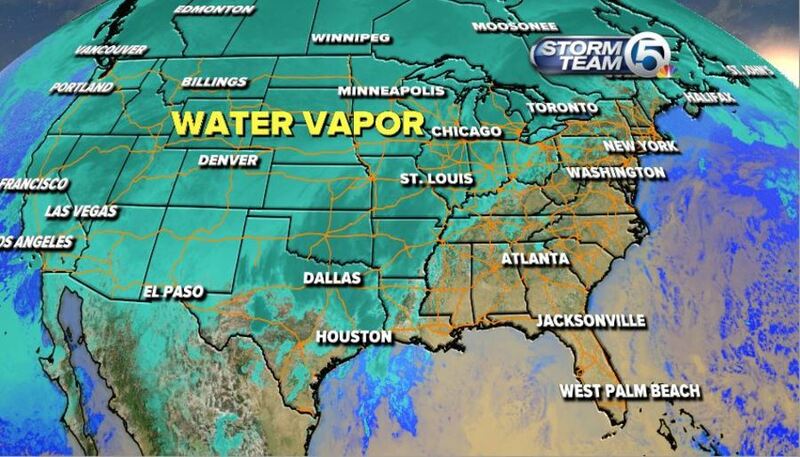 Another usage of the satellite imagery is for water vapor. In the image below the teal represents very moist air while the tan represents drier air. Radar: Radar imagery is a depiction of what the radar "sees" when it sends out microwave radiation into the atmosphere. The pulses of radiation reflect back the radar after interacting with precipitation or the lack there of. The radar technology is able to visually represent those pulses so we know where it's raining or snowing or stormy.